These were the words psychology major Cara Teri ’18 used to describe a recent trip to Bimini, Bahamas, to study sensation and perception while conducting research on wild dolphins. Teri, along with six fellow Manhattan College classmates led by Maria Maust-Mohl, Ph.D., assistant professor of psychology, embarked on a trip to explore and research the behavior and communication of dolphins. 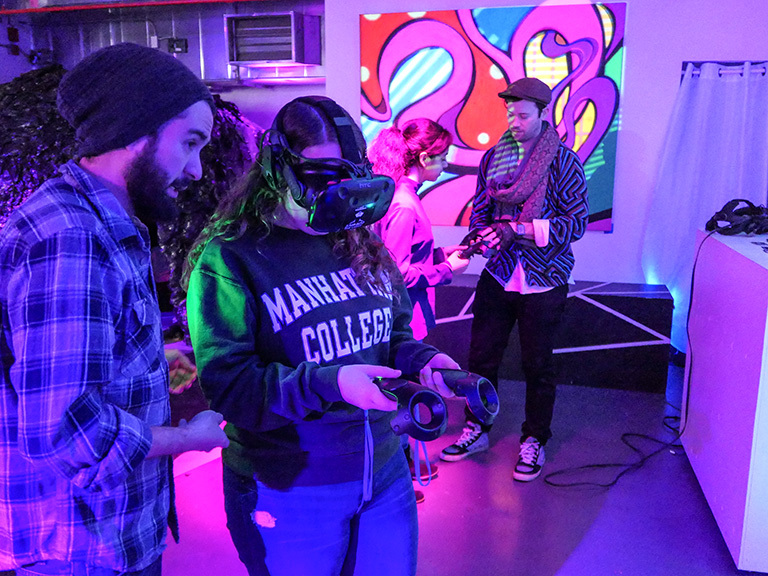 A team from Hunter College accompanied the Manhattan group including Daisy Kaplan, Ph.D., instructor of psychology, and Diana Reiss, Ph.D., professor of psychology and nine students. Kaplan is also an adjunct instructor of biology at Manhattan College. Prior to the trip, the students participated in a workshop to prepare for the fieldwork, and they received additional training in Bimini to introduce them to the study of dolphins. In partnership with the Dolphin Communication Project, an organization established in 2003 that encourages “the scientific study of dolphins with emphasis into understanding their behavior, acoustics, communication, cognition, ecology and more,” the faculty and students collected data for two weeks. “I was surprised to learn that a dolphin slapping its tail meant that they were angry,” says Shea-Lynn Prendergast ’17, a psychology major. 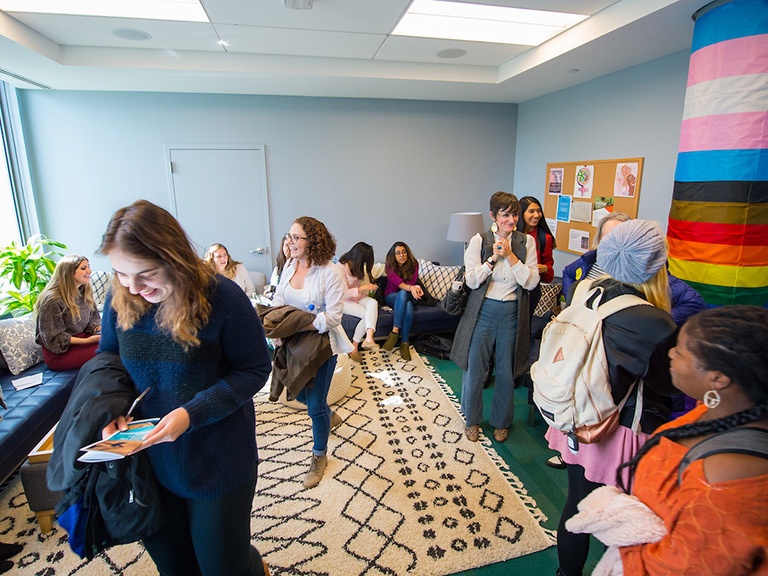 Led by animal expert Maust-Mohl, who has previously studied the behavior and communication of hippopotamuses, giraffes and dolphins, the three-credit PSYC 367 course included 14 days of study and observation of the dolphins in the water. The Bahamian wild dolphin population is familiar and acclimated to humans, which allows observers to study them in their natural habitat. Led by Kaplan, the Hunter College undergraduates and graduate students are enrolled in a summer Animal Behavior and Conservation course. The students went out on daily boat trips to observe the dolphins while snorkeling and on the water’s surface from the boat. In addition to attending frequent lectures organized by the professors, the students captured photos of the various dolphins, observed dolphin behavior, and recorded environmental data and information about dolphin sightings. During the trip, the students also saw sea turtles, fish, stingrays and sharks. In fact, the group visited the Bimini Shark Lab and learned about several research projects studying local shark species. Since returning to New York in late July, the Manhattan team will meet to discuss their overall experience and observations and submit a final proposal later this summer. The proposal is a culmination of the course, and will allow the students to reflect on their experience and propose a project based on their observations. Bailey will work directly with Maust-Mohl this fall on a research project to analyze the data collected including video and sound recordings. Maust-Mohl will determine next steps based on research goals that are part of the collaboration with Kaplan and other researchers. The continued work will contribute to ongoing research on the behavior and communication of spotted and bottlenose dolphins. Recently, Maust-Mohl’s work with hippopotamus communication was published in the Journal of the Acoustical Society of America.